The Only Game in Town's arguments on how to avoid another global economic collapse make sense, but the political will is not there. At a time when all attention in the UK is focused on our 23 June 'Date With Destiny', it is tempting to view any contribution to the public policy debate through that prism. 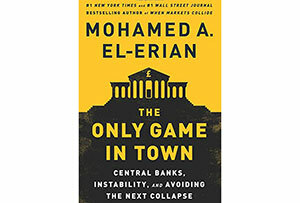 To suggest that The Only Game in Town is about Brexit would be misleading, but in discussing the changes needed in Europe to correct the flaws in economic and monetary union, and to revive growth in the stagnating southern half of the continent, El-Erian does refer to the debate underway here. He argues that the Eurozone, on the one hand, and the UK on the other, are on very different tracks. He sees politicians in the former as being 'on a journey to complete integration'. If so, they are taking a long and winding road, but in the very long term he may be right. Where he is certainly on the money is in noting that the UK 'is focused much more on the EU as a free-trade area'. And his argument is that this is an unsustainable dichotomy: 'reconciling these two visions for Europe needs to happen if the region is to deliver more of its promised outcomes'. I fear I will be in my twilight home, and possibly well beyond it, before any such reconciliation takes place. My point, though, is not to address that argument directly, but rather to illustrate that the degree of political change that he thinks is needed to avert the next collapse is very great indeed. In Europe, his list includes fiscal and political integration, which would involve a complex and fundamental treaty change, and debt forgiveness for Greece, which would be, to put it mildly, a hard sell in Germany. But the change agenda does not stop at the Atlantic wall. In the US, he looks for a significant boost to infrastructure investment, and an overhaul of the tax system, involving 'increasing the taxation of carried interest earned by private equity firms and hedge funds, reforming inheritance taxation, streamlining home mortgage subsidies, and a higher marginal tax rate for the highest income earners'. I would personally support all of the above, but I know that I am in a small minority, and I see no realistic prospect of a majority in Congress for reforms along those lines. How does he justify such extreme and tough-to-achieve measures? His argument is that if we do not grasp these venomous nettles we are headed for the rocks. Through their aggressive post-crisis actions, most notably the massive expansion of their balance sheets consequential on quantitative easing, the major central banks have only managed to put off the resolution of underlying problems in the financial system. He does not oppose what they have done, indeed articulates a persuasive defence of it, and thinks that 'the central banks' unconventional measures did manage to buy time and space for others to get their act together'. But his conclusions are in many ways similar to those set out by Mervyn King in The End of Alchemy - governments have largely wasted the time they have been given. Many have done too little to engage with structural and tax reform. The result is that our financial markets have remained unstable, and we have entered an era of greater divergence, both between countries and within them. In Europe, there are chronic surplus countries like Germany, and chronic debtors in the south who are condemned to slow or no growth indefinitely. Within countries inequality has grown, bringing with it both dangerous social consequences and unbalanced growth. The rich spend less of their income, so for the economy to be sustainable the less rich need to borrow more for a given rate of growth, further accentuating the debt overhang. Projecting these lines forward leads us to the next collapse, referred to in his subtitle. But he thinks a cliff-fall is not yet a racing certainty. The four strands of change he describes are 'pro-growth structural reforms, better composition and level of aggregate demand, lifting of debt overhangs, and progress in completing Europe's regional integration project'. These make sense, but the political environment for them does not seem to be getting any easier, with the rise of nationalist and isolationist parties, and politicians who lack an international orientation. I cannot see The Donald embracing much of this agenda, or indeed Bernie Sanders. And we must recall the wise words of Jean-Claude Juncker, who said, on behalf of his EU colleagues, that we all know what needs to be done, we just don't know how to get re-elected when we have done it.